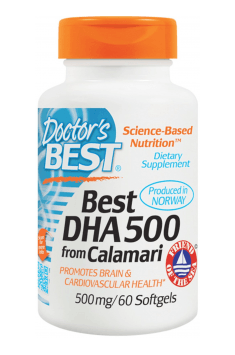 DHA 500 from Calamarii by Doctor’s Best is a dietary supplement containing in its composition DHA at the dose of 500 mg and EPA at the dose of 50 mg in one capsule. Omega-3 acids contained in the product were obtained from calamari, characterized by very low level of contamination, which constitutes a large problem for the majority of supplements available on the market. DHA is characterized by a wide spectrum of effects on the proper functioning of the whole organism, therefore this supplement is recommended to everyone who would like to comprehensively take care about health. Due to its low toxicity, the product is totally safe for children and pregnant women. High intake of Omega-3 fatty acids conditions decreased aggregation of platelets, preventing in this way the creation of clots and embolisms. They regulate lipid balance, increasing the concentration of HDL fraction and decreasing the level of VLDL – very low density lipoproteins and triglycerides, decreasing the risk of developing cardiovascular diseases, e.g. atherosclerosis or heart attack. Thanks to anti-inflammatory properties, they also counteract arteriosclerosis. They influence regulation of blood pressure, heart work and improve resistance to heart rate variability. DHA along with EPA exhibit positive effect strengthening natural defense functions of the organism. They stimulate the growth of lymphocytes and macrophages, responsible for the first defense line against viruses, bacteria, microorganisms and other pathogens. Additionally, they decrease the symptoms and support the treatment of all kinds of allergies. Appropriate concentration of Omega-3 acids is incredibly important to maintain proper functions of the brain. They improve memory, concentration and pace of learning (especially in children), facilitate mental fluidity and protect neurons from degradation – decrease nerve damage. They are effective in the prophylaxis of neurodegenerative diseases, e.g. Parkinson’s and Alzheimer’s diseases. Omega-3 acids increase the level of serotonin in the brain, which is colloquially called the hormone of happiness. Its high concentration improves our mood, well-being and counteracts depression and anxiety. Research carried out on the group of 70 people proved that high concentration of Omega-3 fatty acids, especially DHA, improve mental abilities, visual memory and operational functions, e.g. during performing tasks that require abstract thinking. Additionally, among people who were diagnosed with DHA deficiency, decreased brain capacity was noticed. Omega-3 fatty acids effectively inhibit all kinds of inflammations in the organism. They inhibit the activity of pro-inflammatory cytokines, e.g. IL-6 or IL-1. In such diseases as rheumatoid arthritis or juvenile idiopathic arthritis, the drop in CRP was noticed, which is an important marker of inflammation on the level of the whole organism. Additionally, the state of health and well-being improved among patients and the disease’s symptoms were considerably mitigated. The effect of Omega-3 in these cases is similar to a well-known analgesic – ibuprofen. Anti-inflammatory properties make Omega-3 fatty acids counteract or mitigate the consequences of digestive system inflammatory diseases, such as ulcerative colitis, stomach ulcers or IBS. They strengthen and hydrate mucous membranes of the digestive system, prevent constipations, bloating and dissolve gallstones. Additionally, they are essential in the therapy of diabetes or insulin resistance, thanks to its effect restoring sensitivity of cells to the effect of insulin. Summing up, DHA 500 from Calamarii by Doctor’s Best is the highest-quality dietary supplement containing essential acids Omega-3, obtained from calamari characterized by low content of toxins and pesticides. The product is recommended to pregnant women, children and in the prophylaxis of cardiovascular diseases. For maintenance take 1 softgel daily after a meal. For additional memory and learning support take 2 softgels daily. For heart and other cardiovascular protection take 3 softgels daily. With the aim of complex protection from diseases of the cardiovascular system, improvement of memory and cognitive abilities as well as other health benefits resulting from pro-health properties of Omega-3 fatty acids, it is recommended to increase the dose of EPA during the day. Gelatin, glycerin (capsule), natural lemon flavor mixed tocopherols.